Louise DeSalvo was extraordinary. Many people have said it and many will say it, people who knew her personally and people who never met her but were forever affected by reading even one of her books. She was not simply a writer. She was a magnificent writer, one whose literary daring and power has not been fully acknowledged yet. Literary giants are often not recognized as such by their contemporaries. She wrote memoir, essay, biography, literary criticism, fiction, poetry, flash nonfiction. She was a superb textual scholar when that branch of academic work was off limits to women. She was a brilliant editor. She understood memoir like nobody else and taught countless students and readers how to write memoir and teach memoir to other students. In turn, these students have been so touched by her work that they write, as so many of mine have done, that they are devastated by her death. “So sorry for your loss,” they say. “Our loss,” they add. Louise had a passion for ideas, stories, and words that she could translate into books seemingly effortlessly—seemingly, because Louise worked hard at her craft, every day, five days a week, but never more than three hours at your desk because you need time for pasta and biscotti and Ernie and the kids and the grandkids. What a cook she was. I make some of her recipes—baked zucchini with fresh rosemary, pasta with broccoli and pistachios. It’s like trying to emulate my grandmother’s mythical cooking: just not the same. She was a knitter and a weaver. She practiced meditation and yoga and qi gong. Going on walks in her neighborhood was her daily prayer. She was spiritual and irreverent. She was celebrated and private. She saw through people. You had to be your most authentic self, or she would not waste her time with you. She was so extraordinary that my friend Nancy Caronia and I decided to do a book about her. The scholars and writers who wrote for that book consistently echoed our belief and documented the fact that Louise DeSalvo is indeed extraordinary. What benevolent goddess looked kindly upon me and decided that not only did I need but also deserve Louise DeSalvo in my life? It was early fall, 1995. The phone rang and Josh, not yet my husband, answered. He smiled, surprised, his body straightening as he spoke cordially to the mysterious caller. “Let me put her on,” he said, and then mouthed to me with excitement “IT’S LOUISE DESALVO!” as he handed me the phone. 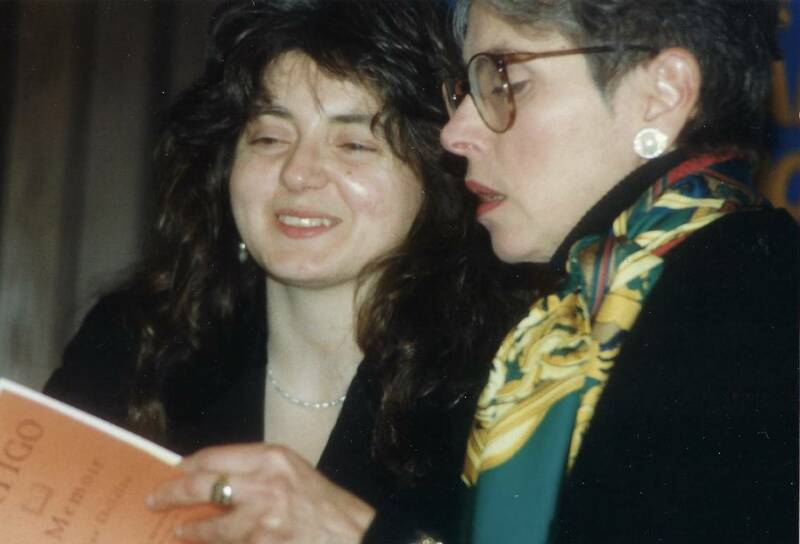 I was an unknown young scholar, unemployed at the time, and I had written to this author I admired but did not know personally, asking her to contribute to an issue of the journal VIA devoted to Italian American women I was guest editing. I was so elated that she called. She said yes, she would send me an excerpt from her forthcoming memoir, Vertigo. And so it began, the most multifaceted and also beautifully uncomplicated friendship of my life, one that has touched every aspect of the person I am and try, in the spirit of what I have learned from Louise, to keep becoming. Over the years, I have written often about Louise’s work in books and articles, but she has been so much more than the author I greatly admired and the woman who gave me the gift of writing and teaching memoir. We laughed, as I reminded her of that phone call, even the last time I saw her, six days ago. Neither of us could remember exactly how we became friends after that formal first telephone encounter. We only remembered being always the closest of friends—no transition, no slow building of trust, no false starts, no deception, no regrets, no spite, no jealousy, just unconditional acceptance and reciprocal love, respect, curiosity, and support that over the years grew and became essential, life-sustaining. For the last twenty-three years, Louise and I have spoken on the phone almost every day, sometimes three or four times a day. There was no obligation dictating those phone calls—only the pure pleasure of being together. Every morning, I brush my teeth and shuffle downstairs, still in pajamas, to make coffee. My hand grabs the phone and I dial. “How are you, honey?” she says. “How are you, bella?” I say. The kids. The husbands. Her grandkids. The houses. The gardens. Trips. Parties. Meals. Always the meals. We talked about food endlessly, even did a book together about food, and while we worked on it sitting at her kitchen table, we devoted as much time to cooking and eating as we did to editing. The quotidian we shared in our daily conversation was wrapped up with serious talk of writing, reading, teaching, politics, spirituality, illness, life, and death. It was all woven together, the mundane and the transcendent, a loaf of braided bread—bread, which she loved to make from scratch. We laughed. We cried. We confided in each other with unconditional trust. Sometimes when she was struggling with a difficult decision, an issue about which she could not make up her mind, I would say, “Can I offer a suggestion?” I had learned from her to put it that way, a gentle offering rather than the imposition of advice. “Sure,” she’d say. And I would proceed to tell her how a good friend of mine had once told me…. She would go quiet and I could almost see her nod. It would take a few minutes for Louise to realize I was offering her back the same precious wisdom she had once given me. And then she’d laugh. And I’d laugh too. And we were content and grateful to share vulnerability and strength in this extraordinarily balanced friendship we were making together. Since Louise’s death, sometimes I feel afraid that I will forget what I learned from her, that the memories of the times together will slip away, that the words we shared during the thousands of phone calls will be forever lost to me. She knew that losing her would be very hard. We are all grief stricken. But she told me I would be okay. And I trust I will, we all will, all of us who so loved her, especially her family—dear Ernie, Jason, Justin, Deb, Lynn, Julia and Steven—her magnificent family that has so lovingly embraced me and mine. Louise was extraordinary. She helped me become a better writer, editor, teacher, mentor, mother, wife, daughter, sister, friend. She helped me learn how to take care of and love myself better. So much of how I live my daily life has been influenced by her, and yet she made it possible for me never to feel the lesser friend or writer or teacher—or even cook. Once—we had been friends only for a couple of years—she told me to cut the self-deprecating crap. As a writer and scholar, I feel the loss of all those books Louise still had in her and that she talked about, the two books that she did start and read to me over the phone, all the teaching she will not do and the writers she will not mentor. But what hurts deep in my chest and in the pit of my stomach is the knowledge that I can never again wake up, shuffle sleepily downstairs, dial her number, and hear her voice, her beautiful, beloved, extraordinary voice. *Edvige Giunta, Department of English, Professor at New Jersey City University.